Hi! How are you? Oh my, it's been ages hasn't it? I have to admit that summer just flew by in super speed aswell as my very well needed rest from Cyberworld and Blogland. It is good to go away for a while. Disconnect and come back with new energy and new ideas. I'm well rested and full of energy. An energy I haven't felt in a long time. It makes me happy! I haven't crocheted that much this summer. I kind of took a time off pretty much everything when flying across the Swiss border with destination Stockholm and Sweden. Summer weather was awful up north. Dreadful. A true depression. But seeing family and friends and hanging out in our very own summerhouse made all the misery disappear. We had a wonderful time even though we had only 4 rain free days in 3 weeks. So happy to hear that most of you are delighted with my choice of joining color for my Circle In Square Blanket WiP. It is growing steadily with a few squares a day in front of the TV. Now when I'm half way through almost, I'm starting to think that maybe I don't want it be a blanket... Maybe I just want it be pillows. But this time I have been so disciplined and fastened off every single end as I go... It would be a night mare to disconnect the squares. A blanket it will be no matter what now. I'm working on getting some of my patterns down on paper. Like the Nordic Hat for example and some other projects I have had lying around for a while. I'm hoping to be able to release some new goodies for you in September. 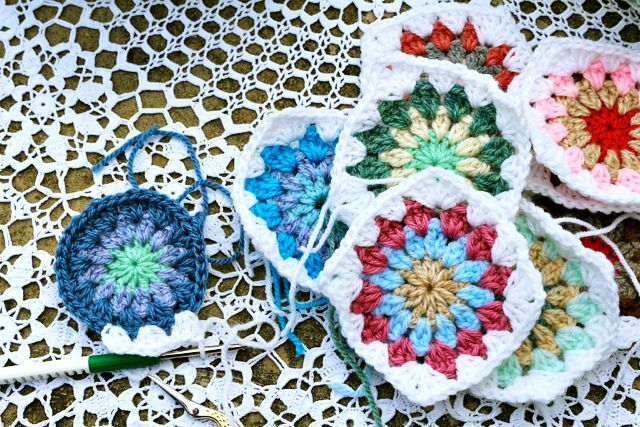 I also have a little idea of sharing some Crochet Tips with you. My very favorite small tips and tricks that makes every crochet WiP a little bit more easy, nice and efficient. Things I've learned through the years such as using a magic ring, crochet into the bottom of a treble to make a ring, crochet a seamless circle, crochet a straight edge without gaps etc. Would that be fun you think? Anyway. I feel almost like a stranger here today. It's been so looong. School has started and everyone is falling back into routine. Me too. I've missed this space and I'm glad to be back. See you around lovelies. Nice to have you back! Glad you're feeling better and full of energy! And indeed, when you're with the right people, the weather isn't that important. Hello back! 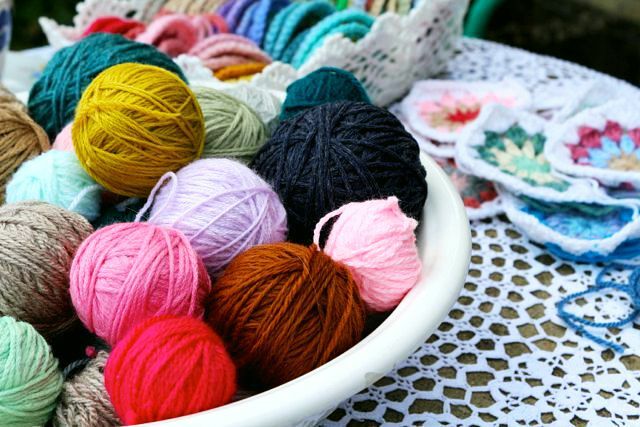 I would love to hear some of your crochet tips. I am self taught and basically a beginner, I can do basic granny squares and a ripple but that would be it. I know how nice it is to take a break too, it's great to feel no responsibility here, we have enough of that in raising a family! Good your back!!! Love your pictures. I think it is a great idea to share your tips and tricks. Kärlek Hello, I love you're doing granny square, the colors on pretty.And I am also doing some ... hopefully finish them quickly, and I have wanted to finish it. Those squares are lovely! You always choose such lovely colour combinations. Welcome back! I'm glad you've enjoyed your break, even if the weather didn't cooperate! :( I would love to read your crochet tips, especially (for me) for that elusive seamless circle! Have a happy end to your summer! Welcome back. 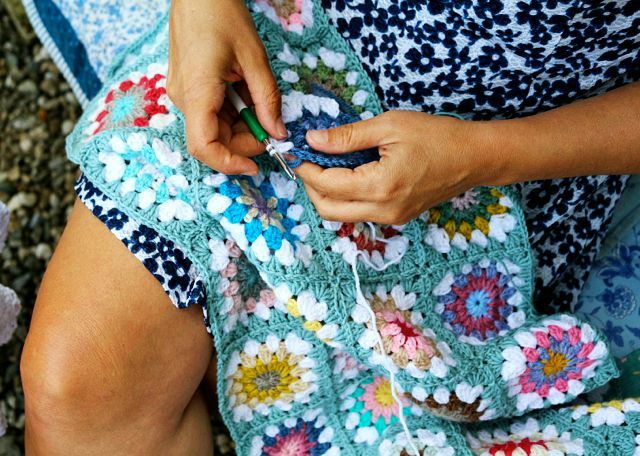 I know already a bit of crochet but it will be wonderful to learn more of your tips and tricks. I Love crochê!! 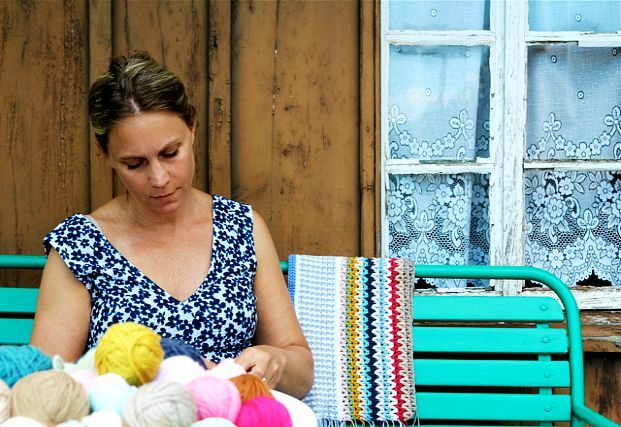 Se fosse sua vizinha estaria ai nesse banco do seu lado crochetando também.Beijo amiga.Valéria.